As of this posting trailer has been viewed 30 million times. Wow. Thanks to the Semi-Retired Gamer for revealing this one to me! I will blame him for my previously non-existent hernia acting up from laughing too hard. Territory: spread out over the vast expanse of the Hyrkanian territory, which stretches from the southern coast of the Iron Gulf to the northern cost of the Baldaric Sea, and westward to the Nyarlith Delta to the eastern edge of the Amech Jungles. There is a lengthy colonial polity that runs along the length of the Great Old Road into the Amechian kingdoms which hold fealty to the Empire as well. Northward the empire encompasses the client states of Eorn’in, Drai’in and Yllmar as well. 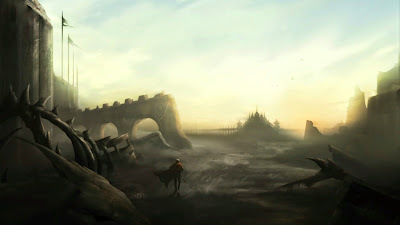 Current Events: Hyrkania has just recovered from a major civil war called the War of Strife, which was instigated by the Cult of the Divinate and the errant King Makhorven of Hyrendan in the south, as well as the dissidents out of Blackholm. Imperial forces now occupy the reclaimed cities, but the tension is still strong, and the corruption runs deep. Hyrkanian imperial forces in this era spend more time putting out fires and quelling dissent than they do actually guarding territory from attacks, monsters, or expanding into new lands. Hyrkanian history is a roller-coaster of conflict, civil war, political dissent and occasional glorious moments when a true leader rises to the occasion and brings stability for a generation. 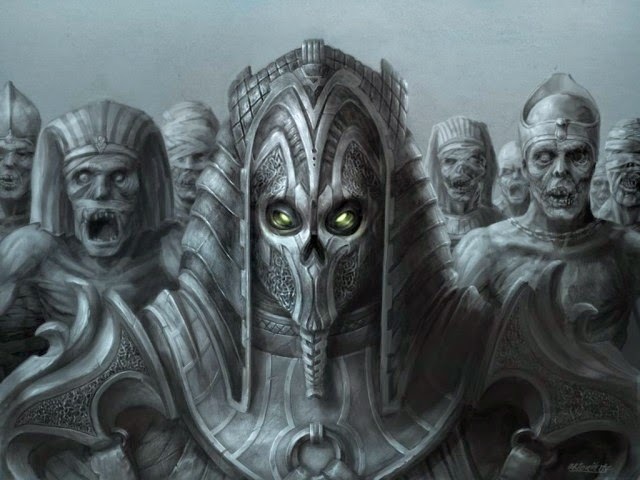 In the current era, that last true leader was Anander Usyllyses III, who led the charge against the rise of the Champion of Chaos in his incarnation as the Dark Pharaoh of Galonia a little over a century ago. Since them, the empire has been stable or in steady decline. The uprising which led to a civil war was part of this decline, and though the empire rallied against the attempted coup led by King Makhorven and House Strallikus, the civil war itself has been seen as a sign of trouble by many others who would plot against the Emperor or seek to carve out their niche of power. In the grand mythology of the empire it is said that Hyrkania was called the Fertile Kingdom, a cluster of small kingdoms and city states which surrounded the lush and hospitable region that was shadowed by the ancient and enigmatic city of Corti’Zahn, a magical polity of floating towers and temples from which the ancient priests communed directly with the gods, who would visit the city in physical form. The concept of Order and Chaos as physical manifestations of the universe pervade the very thoughts and mataphysics of Hyrkanian belief, and in the ancient era it was believed that the gods of Corti’Zahn were agents of Order. The Fertile Kingdom existed for centuries, faithfully worshipping the gods of order and exstinguishing the cults of chaos where they could. Prior to the fateful day when Chaos and Order boiled into war on the physical plane of man it was believed that the kings of that time had become complacent in their beliefs, and that the cults of chaos were given free rein to worship side by side with the cults of order. It was this grave mistake in tolerance that led to the War of the Gods. Hyrkania’s northlands have been occupied continuously by humans and other races for close to ten thousand years, but the first written records of actual civilization don’t appear until about 7,400 years ago. The first noble dynasty of kings, called the Elevasos in the middle tongue, shows up in old records dating to 4,900 BW (6,990 years ago). More important than the appearance of the first kings was the appearance of the first known copies of the sacred Idean Codices, the ancient tomes which defined the land’s understanding of the gods and man’s place in the world. The first recorded copies of the Idean Codices date back to 4,500 BW (6,590 BW). The first notable records of war and conflict in the Hyrkanian lands appear around 4,400 BW and grow in volume and detail from there. At this time most records still intact from this time were saved on stone tablets, many of which were baked into sturdier ceramics. The city of Hyrkan’ien is first identified in a tablet dating to 4,138 BW during this time, indicating that the settlement had grown by this point to a notable city of the region, and was where the Elevasos of the north ruled during what was known as the Usyllian Dynasty. This Dynasty lasted until 13 BW, a little over a decade before the War of the Gods. During the Usyllian Dynasty the name Hyrania, taken from the largest city of the time, was adopted as the title of the unified kingdoms, though exactly when this occurred is uncertain. The empire of Hyrkania was firmly established in the last five centuries leading up to the war. Notable achievements in this period included records showing the construction of the Great Road, a route of travel which was carefully maintained and protected by frontier outposts and which stretched from the western border of the Hyrkanian Empire to the eastern shores of Old Zued. A distinct record which holds great historical value in the Grand Librarium proclaims the road started in 215 BW with the assistance of “the Ivory Kingdom of Amech” and completed by 156 BW, meaning it took the Imperial engineers 59 years to forge the continent-spanning road. The year 13 BW was of great significance. A new dynasty took power, and Shakytis I rose to power after a brief civil war. His reign would end thirteen years later when the War of the Gods erupts, devastating the kingdoms of man and god alike. Many believe that it was Shakytis I who was responsible, for he resolved the religious wars of the era by allowing the cults of chaos the freedom to worship publically. The stories of this period and the war are many and often contradictory, but here is what is known: in this early era it was known that there were sacred artifacts of the gods which embodied the divine qualities of the gods of each pantheon, that of chaos and that of order. The Orb of Order, manifested in the form of the sacred Ankh of the Cult of Naril, was believed to exist and was protectively kept in the temple of the Grant Sacrimori in Corti’Zahn. Though the myths of Hyrkania dictated that there was an Orb of Chaos, it’s location in the world was unknown. Xauraun, a young aristocrat of Hyrkania at the time, found the Orb of Chaos on an expedition to the dark corners of the world. The story of exactly how this seemingly ordinary person found the orb, was corrupted by it, and eventually became the immortal Champion of Chaos is poorly documented, but it is known that at some point after finding the Orb Xauraun was seduced into the service of Chaos by the whisperings of the god Dalroth, and that Dalroth granted Xauraun immortality in exchange for the power to use the orb. When Xauraun unleashed the orb’s power per the directive of the lords of Chaos, it formed a permanent gate to the Abyssal realms, a dark realm of vile chaos from which Dalroth had forged an entire demiplane in which to create an army to do his bidding. The demons of the Abyss erupted into the mortal world, right in the heart of the Fertile Lands of Hyrkania, near Corti’Zahn. The war lasted one year, and it left the fertile lands a desolate waste, most of the local kingdoms and cities destroyed in the conflict. The city of the gods, Corti’Zahn, was sacked and pillaged, and it was said that the corporeal forms of many gods had fallen in battle. Forces outside of Hyrkania’s central region, what is now know as the Hyrkanian Desert, united under the banner of chosen of the gods (avatars), including a young wizard named Warenis who was given the power to serve as the Champion of chaos. The forces of order would strike back to eventually destroy the marauding demons and close the portal, but not before the damage had been done. Burial of a god’s corporeal body is a devastating blow to the worshippers of those gods who had fallen in battle. Gods, being immortal, could transcend their corporeal flesh and continue to exist as spiritual beings, so many of the physical forms slain had not meant the termination of that god’s influence in the mortal plane, but the mere thought that their deity was fallible in the form of flesh was enough to send great concern through the cults of the gods. Some cults fell apart, and it was the loss of belief, of followers, which ultimately destroyed the spiritual incarnations of those gods. Hyrkania went into a state of spiritual decline and Emperor Catythytas, the imperial successor to Shakytis, who had been slain during the war, forged the imperial calendar on year 1 to mark the date of the great fall. Catythytas provided a great deal of much-needed spiritual direction, coaching the end of the war as a great victory for Order and the pantheon of the gods that Hyrkania so revered. The cults of chaos were once more forced into hiding lest they be destroyed, for a dozen years Caythytas helped rebuild as well as relocate those who had survived the war but were now displaced from their homes. Around 12 AW and not ending until 142 AW the empire declined into a series of internal civil wars and more than two dozen men would lay claim to the title of Elevasos or Dei’Elevasos (supreme emperor). The spiritual health of the empire was in decline once more, perhaps fatally so. During this period there was some hope. Emperor Kravostys came into power in 65 AW and ruled for 23 years, during which time he began construction of the Emerald Palace, a grand dome of pure emerald constructed from the ancient Temple of Monuments in Corti’Zahn. It tooka century to dismantle the damaged temple in Corti’Zahn, which like many of the towers of the floating city after the war had crashed to earth, and reassemble them in the center of Hyrkan’ien. The dome itself survived three great rulers, and was completed in 140 SW during the rule of empress Tythiis. Within the dome the new seat of power and the house of law was founded for the empire. This proved to be a compelling symbol of rule for Hyrkania, and helped with the long term stability of the empire in centuries to come. The peaceful period of Hyrkania would be upset three centuries later when Emperor Vestillios rises to power, following a bloody coup in which Abernan Usyllysys II is deposed. Vestillios began a 23 year long rein of terror in which he engaged in extreme religious persecution of all current cults and faiths, though in time it became clear that the hidden cults of the chaos gods were somehow exempt from the emperor’s wrath. His rein ends when the reincarnation of the Champion of Order, Warenis, reappears and reveals that Vestillios is actually Xauraun, the Immortal Champion of Chaos. This period was noteworthy because it was the first clear proof that the champions of order and chaos were immortal reincarnates; they would live many lives over many generations, eventually reaching their peak of power and causing the age old conflict between their divine pantheons to erupt once more. It was also noteworthy for the penal colony of Noenday to the west, which would eventually lead to the emancipation and founding of the Kingdom of Octzel, Hyrkania’s largest contemporary political rival. Religious wars would erupt often in Hyrkania, with the Second Faith Wars striking between 615 and 625 AW, and the Third Faith Wars embroiling the empire for three decades from 670 to 699 AW. In 700 AW the Empress Syrradalis I came into power. She was noteworthy for being a high priestess of Naril, a sacrimori who stepped down from her position as chief priestess of the god of light to assume control of the empire. This act created an unpredented level of unity in the Empire as the cult of Naril was formally adopted as the civic religion of the empire. For several hundred years Hyrkania went into a period of peace and introspection, with a focus on trade and commerce over expansionism. That all came to a halt around 1,400 AW when a series of events provoked a change in policy: first, the old Kadantanian Empire in Amech fell with the death of its last sorcerer king. Second, the southern Hyrkanians began to encroach on unclaimed territory in Sendral and Eastonia, as the southern kings grew impatient with the Emperor and decided to take their own approach to expansion. Finally, the threat of Octzel expanding into old barbarian territory was growing too great to ignore. The western expanse of the Middle Kingdoms, often characterized as an uninhabited no-man’s land in most imperial histories, was actually bustling with barbarian tribes and locals who saw the imperials as a dangerous threat in the east. With Hyrkania’s first major western colony seceding from the Empire and successfully remaining independent long enough to grow strong, Hyrkania now had a real rival to its western borders to worry about, and with the faith wars in the distant past Hyrkanian emperors of this period pushed to claim territory which had been held too long by the uncivilized barbarians of the wilderness. In the coming years Jhakn would be founded, as would Ocentash, Eastonia, Sendral and Galvonar. Border wars with Old Galonia, which itself had fallen into decline, marked the southern-most incursion of Hyrkanian expansionism during this period, and interestingly left its long-term mark in the form of the imperial province of Persedonia, which eventually gained independence and would one day become Hyrkania’s greatest contemporary foe. The Age of Strife is the most recent period of Hyrkanian history, and scholars argue that this period of time began in 1,927 AW when Anander Usyllyses III is coronated Emperor (Dei’Elevasos) of Greater Hyrkania. Anander was a noteworthy ruler, and quickly formed an alliance with Sylvias to the south, the forest kingdom of the ancient Silver Elves. Anander and his wife, who could not conceive, receive the gift of one of the elven king’s daughters, Phyxillus, who becomes the adopted daughter of the emperor. The first and greatest test of Anander’s rule was during the rise to power of the so-called Dark pharaoh, Xauraun, the Champion of Chaos. Reincarnated into Old Galonian royalty Xauraun set about attempting to unify the forces of the dark corners of the earth into a powerful army to extinguish Hyrkania and forge a new empire of his own. The war lasted from 1,960-1,962 AW when a new force of chosen, avatars of the gods brought together by the Champion of Order Warenis, thwarted Xauraun before he could recover his full power. Xauraun was banished or slain (stories vary) and the realm was saved early on from another age of chaos, as had come on those prior occasions Xauraun reappeared in a new reincarnation. From 1,962 to 1,994 Anander rules, and in his ancient years under advisement of his adopted daughter and her husband, the northman Gilrad he passed on the mantle of emperor to Tyberius Usyllyses IV. Tyberius rules with the wisdom of his predecessors and sees the kingdom through the lengthy Border Wars between Octzel, Jnril, Dorasha, Ocentash and Eastonia that last from 2,003 to 2021 AW. In 2,028 Tyberius passes away unexpectedly leaving no heir, for his two sons had both died in battle during the wars. The empire is without a ruler for nearly a week when a general council of regents under the direction of the High Sacrimori elect to appoint Damon Kargonin, the general of the Solarian Knights as the Dei-Elevasos. This is the first military appointment to the position since the era of the old Faith Wars. Kargonin’s appointment marks the end of the Usyllyses Dynasty, and the beginning of a new era which to date reflect political appointments based on dedication to the empire over bloodright heritage. Kargonin ruled until 2,050 AW during the first civil revolts against his strongly militaristic rule. A massive increase in the empire’s military focus under Kargornin leads to a tripling of the empire’s military might and forces are sent to sieze more territory in the north in a bloody war against the Hettanar, even as Covarte is taken in a brief two-year military engagement. Kargornin’s drive isn’t just expansionisn; he seeks to spread the word of Naril to the rest of the world. Kargonin is assassinated in 2,050 while visiting the city of Hyrendan in the south. Unknown to most, the assassin is the aspiring young Makhorven, who would seize the throne and declare a cessation from the empire twenty years later, an event which preludes the War of Strife. When Kargonin was assassinated, the Council of Regents met at the Emerald Palace and appointed a new Dei’Elevasos, this time chosen from among the rikes of nobility who had served as officers in Kargonin’s armies. They chose the young but tactically brilliant Armigos Patraeus, a gonn of some repute who’s family ruled Hyrmyskos. Patraeus at age 20 was the youngest likely candidate for the job. Armigos Patraeus tightened up the military focus of the empire, pulling back from expansionist efforts everywhere except for Covarte, which was now firmly locked down as a client state. He turned instead to focusing on the civil unrest within the empire, and used brutal force to destroy opposition. The brutality of Armigos was shocking to many, and led to an increase of civil disobedience and outright rebellion. By the time Armigos passed away of natural causes, he had however already established that he intended his son, Anton Patraeus, to be his successor. This caused a great deal of concern among the regents, who were reluctant to allow a return to succession by heritage. Nonetheless, Anton was coronated emperor and began his rule in 2,083 AW, in the middle of the budding era of the War of Strife. 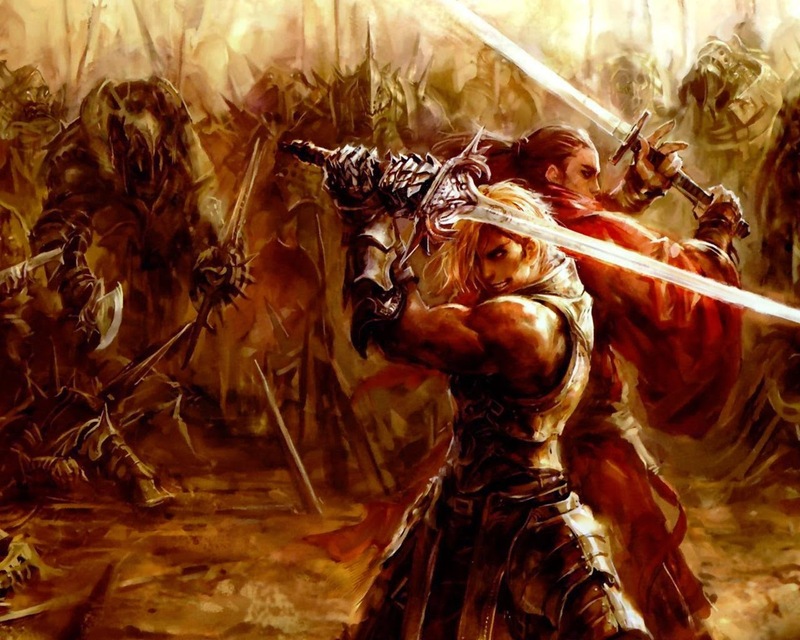 From Hyrkania’s perspective the War of Strife was an inevitable build-up on two sides of the empire’s lines of power. Old houses such as Strallikus which secretly supported the chaos cults were suddenly interested in aligning with the secessionist states of Hyrendan, Blackholm and even Malas, which had been dragged into the matter reluctantly. The focus of old imperial houses backing the secessionists led to a formidable rise in power and made the civil strife an all out war. Behind the scenes and unknown to most ordinary men and women the Champion of Chaos, Xauraun had returned, as has his counterpart Champion of Order, Warenis. In this era, the two champions now required sacred ancient artifacts to awaken their dormant memories and powers, and a rush to acquire the old artifacts was underway amidst a backdrop of civil war. 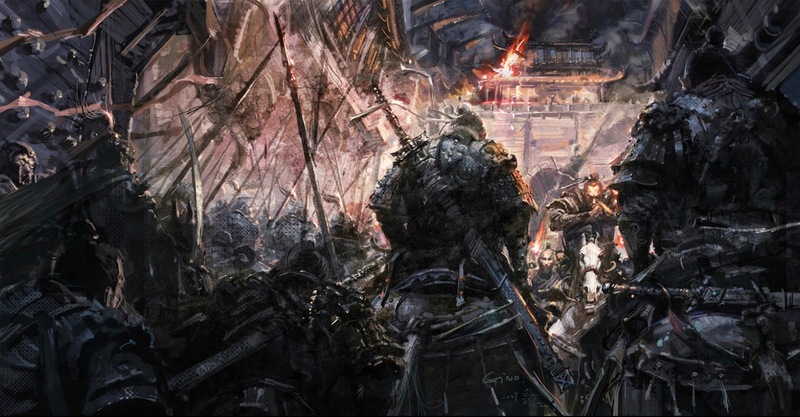 The full war erupted in 2,085 and did not end until 2,089, a year prior to the current date, with the march of the full army of the empire, the fabled avatars of old leading the charge. Hyrendan and Blackholm both fell, and King Makhorven was placed in chains beneath his own perilously deep dungeons. The free city of Malas immediately capitulated its relations and proclaimed its loyalty to the empire. Malas would pay in stiff penalties and poor treatment thereafter, the emperor proclaimed. Yes, I have the Dungeon Master's Guide....and this book lives up to and maybe even exceeds the expectations set by the prior two tomes in the 5E family. It may be my favorite DMG yet, actually. There's a lot of content in here. The gritty realism rules option for resting caught my attention and I had to share it, because it's so elegantly simple: under the gritty realism rules a short rest is defined at 8 hours, and a long rest is defined as one week. So that action surge you want to recover, or that bonus spell slot you need a short rest to regain? Check back in 8 hours. That sucking chest wound you took that won't heal because the barbed devil ate the cleric? Should be fine in a week or so, if you live that long. Think about that for a moment, and tell me that wouldn't grit the hell out of your game. There'd be so much frikkin' grit you'd need a sturdy toothpick for your teeth. Assuming you had any, in such a gritty world. I am very interested in trying out a 5E game where the gritty rest rules are on now, it sounds excruciatingly tough. The Dark Souls variant of D&D, if you will. Warning: the following may be incomprehensible to those not intimately involved in the actual campaign (and may be borderline incomprehensible to those who are!) Ironically some of my old players from the 90's will probably recognize many names and events....including some of their own characters.....Anyway, it's for me, to keep it for posterity where I like posting stuff. You have been warned! The world of Lingusia, in the year 2,090 AW, as it exists after the events set in motion by the agents of the god of time, Huaarl and his seraph Aeon. In this timeline the future Unarak was stopped from corrupting the timeline and destroying the “fabric” of the cosmos. Hyrkania is a strong empire, which has recently weathered the War of Strife initiated by the vile occultists of the Red Robes against the immortal avatars Phyxillus Usyllyses and Gilrad Hyradson. In this era the schemes of the disembodied spiri t of the Champion of Chaos, Xauraun Vestillios are directed in a manner different from that which has happened in prior timelines as the collapse of the Era of Prophecy by the changes wrought by the Chrononauts of Huaarl have insured that the gradual weakening of the contemporary deities did not come to pass, and the schemes of the Skaeddrath have been set back centuries, if not millennia. Hyrkania is still a strong empire though civil strife in Sendral and along the coast of the Inner Sea, as well as the constant warfare with local tribes to protect the empire’s interests along the Hettanar border and the trade routes through Amech to the east keep military forces otherwise engaged. Major heroic personalities are prominent in this period: Catea Gonn Aleric, the necromancer madame of Octzel is active and scheming, though she is now free of being a pawn to the Prophecy which has been thwarted by the Chrononauts. Margda Dan Malik, Davin Kormak, Sylas Nathylien, Teylayurana Sorinos, Celiobantes Astiriate, the venerable Wormie Vellsoth, Dihralk Nephu, Netharien Ariel, Selene, undead Quirak and many more are active in this era. Because the Era of Prophecy was erased from the timeline, certain key events did not or will not happen, including the “Great Anvil” event which created the small moon/god Poltrietie. Poltrietie, hatched from a seed of the World Tree, is instead to be carried to its desintation, located deep in the Great Plains of the heart of Lingusia, where it will forge the new World Forest it was intended to. The seed does more than just create a vast forest, it also “terraforms” the land, and it will create a vast new realm of wilderness which the elves who seek to bring Poltrietie into the world intend to colonize. With no Era of Prophecy in place, the ruse that the Skaeddrath created to disembody the power of Chaos as a trick to persuade the gods of order to depart from this plane of existence during the future event of the Reckoning is not happening. Though this event began in 2116, the events which set it in motion began much earlier, and the War of Strife was at least partially instigated to create the necessary weakening of the bond between chaos and the Abyss, to allow the Skaeddrath’s followers (the Prehunates) to push the dominions of chaos and the Abyss away to insure the prophecy would happen. Since this did not come to pass, the War of Strife instead transpired as a result of the rise of King Makhorven and House Strallikus to power in Hyrkania, leading to the first attempt of King Makhorven in the south to usurp the rule of the emperor Patraeus. 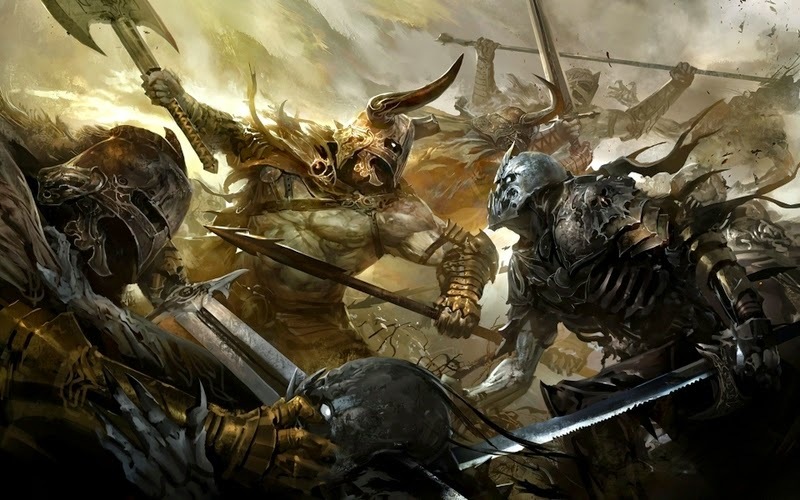 Without the Prehunates guiding this process, the abyssal realm remained tethered to Chaos, and as a result the war proved both bloodier and costlier in lives; the conflict raged from 2,085 through the end of 2,089, ending only when the armies of Hyrkania, led by the avatars Gilrad and Phyxillus directly sieged the city of Hyrendan and Blackholm, bringing them down. Both cities are now occupied and under the care of General Aserius as of 2,090 and King Makhorven is in chains in the dungeons beneath his own city. A new insurgency is brewing, though. Meanwhile, demons unleashed through the magic of Belasco Strallikus still roam the world freely and a bounty on their destruction stands for any bold enough to try for it. Diannysos: awakened from her ages-long slumber by Kadantanian renegades, Diannysos currently dwells in a lost city deep in Chigros as she gathers resources and restores her ancient power. 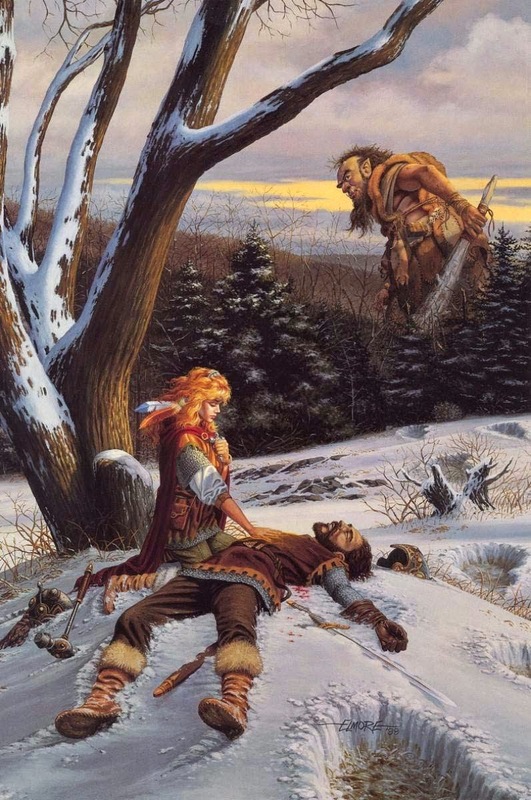 She is the most dangerous of the three, for it was her knowledge of the old prophecy that allowed her to act to commit to the ultimate revenge of the Prehunates against the gods, so her future plans inevitably must include new and dire schemes against the deities which destroyed her people. Eskandar: in this era he remains a Vestige, a hollow shell of his own existence serving only to commit terrible murder in the Dreamlands. His legacy from long ago, in which Seven demon lords were each bound to the Amulet of Eskandar to protect a portion of his soul remains undiscovered. The amulet still resides scattered across the material plane and the Abyss, it’s power to restore Eskandar forgotten. 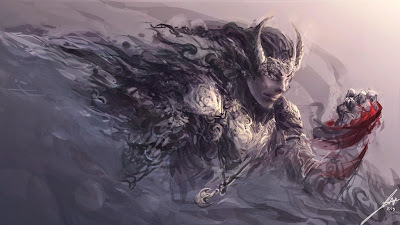 Zelkarod: dwelling in physical form deep in Ashturak’s Mountains, Zelkarod has not ascended to power as a demiurge and remains a stoic keeper of one of the only intact ruins of the dead race of Prehunates. His existence is a mystery to most, though the followers of Hodon Systalien know of him and have visited his domain in their quest for knowledge. Unarak was the demiurge manifestation of Anharak, the half-orc warlord who sought sorcerous power and immortality in the 1,950’s. Unarak’s vestige was destroyed in this timeline before it could do harm, but Anharak lived to fight his war against the Silver Dwarves. Anharak was slain by an unknown hero who fought in the battle, where his body was interred, just as he had in the prior timeline. How and when he awakens as an undead lord remains unknown at this time, though rumors of a vile lord of darkness named Unarak are just now surfacing in the Silver Mountains north of Covarte. Phaedra rose to power when she murdered her mentor, the lord of shadow Avarath. Avarath did not attain power until after the Reckoning, but with no reckoning now possible the shadow god Umbras remains in power in the Shadowfell. Phaedra’s form which returned t the past was slain by Huuarl’s agents. The only deity of the Shadow Gods to still hold potential power at this time is Amadan, who appears to be an ancient god, possibly the direct child of Wolfon and an unknown goddess. Amadan is only worshipped at this time by remote tribes in the Chigros wilderness. The destruction of the Prophecy which created the new timeline led to a change in the events during the rise of Corrigan the Witch Queen. In the original timeline her quest for power Corrigan thought to possess the unfathomable knowledge of the Orb of Oblivion, only to discover that it was too much for even a demigoddess to bear. In the course of these events Xauraun Vestillios returned to power when his immortal soul awakened in its newest incarnation, only to be slain and trapped in a soul gem by Black Annis. This entrapment would insure he could not reincarnate, but Xauraun figured out how to forge the gem into a ruby golem body. He was ultimately stopped and dismembered by Aurumurvox, though not before slaying Corrigan in spite. First, Corrigan the Witch Queen returned from her exile in the Feywild with her visions of power and revenge. However, without the vision of the prophecy she was not tricked into taking the course of action that would lead to the Champion of Chaos from being effectively removed from the scene….another action which kept the bond of Chaos to the world strong. Instead, Corrigan brought the uneelie back into the world with her, and began a quiet war against the fair elves of Sylvias and Niras, while offering the Ashtarth of Dahik an opportunity to restore their connection to the feywild. This action led to an even greater strengthening of the bonds of chaos as dark elves were allowed to reenter the feywild for the first time in two thousand years. This war is ongoing. The Lich King, Laikhanamen, realizing his exiled love had returned, redoubled his efforts to capture her once more. His forces work to retrieve her or even to make contact, but her strength with the unseelie makes it difficult. While all this is going on, Xauraun and his beloved Tyriandras watch as King Makhorven and Strallikus cause strife within the empire, weakening it from within. Xauraun begins to quietly rebuild his power base, reaching out to old allies and new to reveal that the Champion of Chaos has returned. 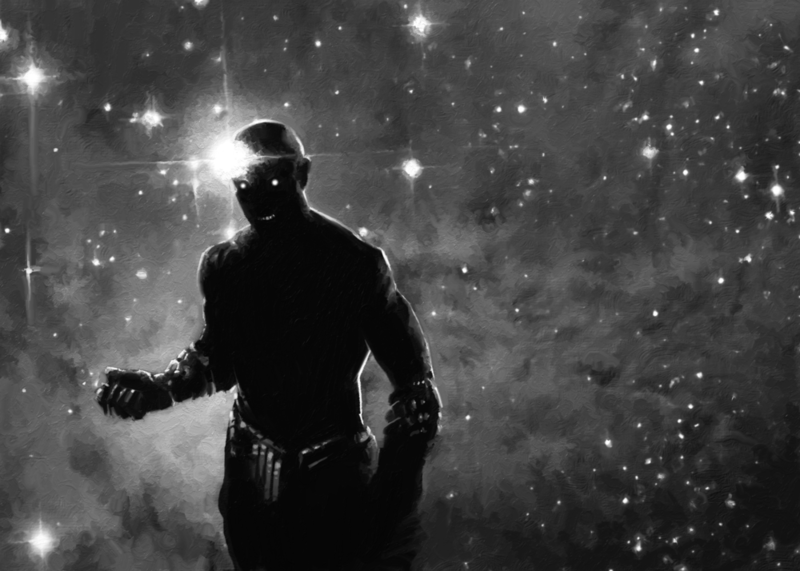 His cults are revived in Galonia and Persedonia. In a surprising move that take all by surprise, Xauraun relocates his center of power to a lost city of a forgotten empire deep in the Northern Wilderness, where he begins to gather an army of gnolls, orcs and giants to conduct a new war in the north, even as Tyriandras works to sew chaos from within the Empire itself. The War of Strife is seen as a sacrifice, a perceived victory by order that is really an increase in the influence of chaos…. Without the prophecy to influence him, Saurpikan chooses a more refined course of action. As he sees the dark elves of Dahik brought back into the courts of the unseelie to sew chaos in the Feywild and the human civil war within Hyrkania unfold Saurpikan decides to commit to a new action in which his people will thrive. Polymorphed agents are sent out to infliltrate Hyrkania, replacing soldiers and civilians lost in battle as well as ashtarth, to seek to influence the rival enemies from within. Saurpikan continues to cast about for a great sign that will aid his people, and he does learn of the seed of Poltrietie, but without the manifestation of the prophecy he is unable to act upon this knowledge. He does barter the information of the seed with the queen of Dahik, Anaxia, who in turn sets a plan in motion to thwart this divine event by the elves. Like with all else, the avatars of Lingusia in this age, the eponymous “Keepers” of the land chosen by the gods to serve as their spiritual representatives, continue to thrive and function. Without the events of the Prophecy underway, the mad monk who uncovered the Infernal Book of Prophecy never created the ritual that opened the chasm to the Abyss in 1,980. This was the first weakening of the chaos boundary under the prophecy….but since it never happened, this avoided conflict ironically meant that the bind of Chaos to the Abyss remained strong. Without the conflict that led to years of planar wandering in service to the gods, the avatars instead continued to travel the world and explore the vastness of Lingusia. Wormie Vellsoth wandered through many lands though he eventually journeyed back to the feywild, where he was entranced by the arboreal lands of the fey and spent much of his time there, not to leave until he was called once more to duty as an avatar during the War of Strife. Since his return to the mortal plane Wormie has journeyed among his wild and wood elf tribes, seeking to spread the word of the faerie homeland to them and the connection to the weirding that elves have all but lost. Phyxillus Usyllysses and Gilrad Hyradson continued as the immortal emperor and empress of the great empire for decades after the fall of Xauraun in 1,962. In this timeline things changed ever so slightly; the two did not conceive a son who they raised to become a new, young emperor that would eventually fail, for they had been warned of the dark times ahead by the two chronomancers and servants of Huuarl as to their potential fate (Pennywhistle the bard and the monks Horus and Aman). So warned, the two elected to step down from the throne, appointing the rule of Hyrkania to the young cousin of Anander Usyllyses after the elder emperor passed away. Anander’s cousin was Tyberus Usyllyses IV, a man who had served as both an Emerald Knight and fought in the brief border wars with Octzel around 1,980 AW. Tyberus and his clan assumed the rule of the empire, and the avatars stepped away, to wander the planar realms with their cohort Wormie and the elven avatar Selene Fairchild. They would not return until the War of Strife, when called upon by the gods to defend the land once more. In time the two did have children, and in fact raised an impressive family in the lands of Arborea, in the barony of the Ghaele Asualdon. Phyxillus and Gilrad reappeared, no longer as rulers of the land but as holy avatars, to fight at the front of the battle. With Gilrad stood his two strongest children, Denarchus and Tyriadne Gilradson-Usyllyses; in a twist of irony it was Denarchus who took after his mother as a natural spellcaster, and Tyriadne who found the heft of a sword more to her liking as was her father’s proclivity. When the War of Strife ended, Gilrad and Phyxillus retired back to Asualdon in Arborea, but their eldest children saw fit to continue to explore the mortal plane from which their heritage came, as half-elves are always prone to inquisitiveness. Tyriadne has sworn her sword to Emperor Patreus Usyllyses, great-grandson of Tyberus, and Denarchus has gone to study under the tutelage of the immortal Hodon Systalien, to learn of the Esoteric Order of Knowledge. Gamer Dad + Gamer Kid + Disney Infinity = Disney gets all my money......ah crap. 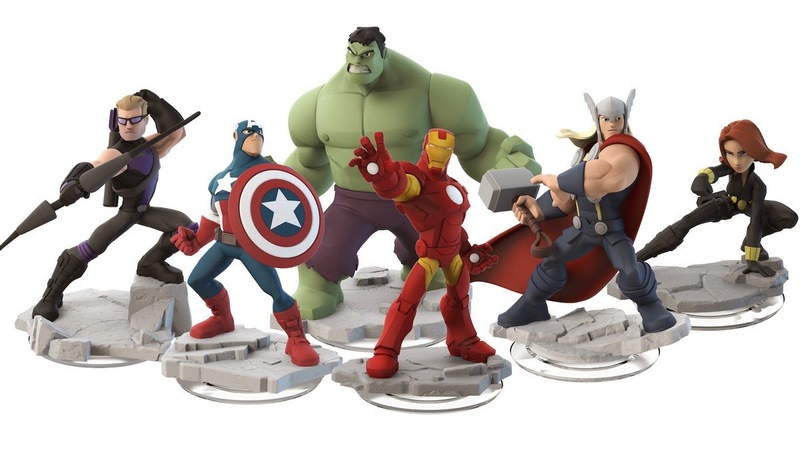 Disney Infinity is evil, and it's the sneakiest sort of evil. It has Marvel heroes for the guys and Frozen, Stitches and Maleficant for the girls. It's all very cartoony, but just interesting enough that it can grab both parents and kids. If you're a parent and you want something that's right at that interesting border of complexity where you can enjoy a thing without growing bored and your kid can also enjoy a thing without growing frustrated.....this is it. It requires you to "respawn" by putting a new character on the game pad when you die. You also get new modules and things using these "discs"....which seem to sell in convenient randomized packs. The physicality of it always struck me as oddly gimmicky but I now realize it's an insidious, diabolical marketing scheme which truly manages to hoist the pirate flag of Disney over your miserable wallet. My only respite is knowing my son right now only wants the Marvel characters. But let me tell you....I desperately want Hasbro to get Dreamworks now because if Disney snagged them, the torrent of "How to Train Your Dragon" figs that my household might demand would be nightmarish.....! Anyway.....it's a fascinating concept, and Toys R Us was nice enough to have around 30% to 50% off all DI products "Black Tuesday" sale in time for my son's 3rd birthday. He's been playing it nonstop for the last two hours, although admittedly he doesn't so much "play" as run around and do all kinds of crazy stuff only a 3 year old would think of, all while switching characters and setting every five minutes. Dad may even take a break from his more serious games to play a little, too! The Age of Strife is a delve into the sort of madness that only a three decade old fantasy setting can inspire. My world of Lingusia has gone through so many incarnations and so many campaigns over the years that it has evolved into a weird sort of beast, one which spans nearly two thousand years of history over two revisionist timelines. Every game I have ever run in this setting has been sequential, and always built on what came before. No dungeon was ever recycled without also being revised at a later date to reflect what sort of madness was introduced in prior games. No plot line was ever conceived that didn't account for what had come before. In the last few years I even ran a campaign that turned into a time travel fiasco that led to a fundamental change in the setting's history, leading to a sort of "timeline reboot" which is what this new Age of Strife campaign is all about. Sounds a lot like Star Trek, except the only one's to worry about chronology and consistency are myself and the handful of players who have been gaming with me for ages....and they just love a campaign where they see their own handiwork in it's ultimate design. 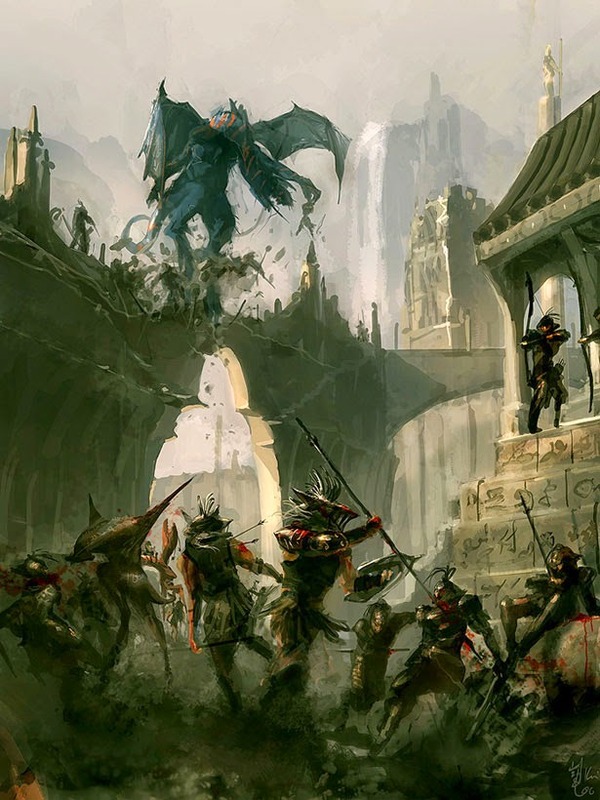 Warlords of Lingusia: published on this blog, the Warlords Era dealt with the world in 3,500 AW when it's clear something has gone horribly wrong and the threat of the Skaeddrath (called the Kraken in the KOL period) is imminent, and the world's end is not far away. The campaign in this period ran from 2008-2012 and led to a lengthy campaign exploring this dark future of the world. It concluded with a campaign arc leading to the adventurers becoming agents of time for the god Huuarl, and going back into the past on two occasions, creating permanent changes to the future: the first was to stop the events of the "Prophecy" events from KOL, and the second was to stop Unarak and the Shadow Gods from going back and time and murdering their enemies' ancestors before they were born, then achieving divine power well before they were supposed to, leading to a Dark Age and collapse of the old Empire of Hyrkania too soon. The heroes succeeded, and that entire campaign ended with the time agents (chrononauts), having righted the wrongs commited by the Shadow Pantheon, settling down to enjoy the new timeline. Empires of Lingusia/Ages of Lingusia: This era deals with events around 1,952 to 1,960 AW following the timeline reboot. It was a "revisit" of the original timeline of my earliest campaigns when I first started running AD&D in 1981-1984, and a fresh reimagining of the era from my modern eyes. It's also when the key "alternate history" event spin off to create the new Age of Strife. I ran a few campaigns in this era, the last one using 13th Age, but no single campaign had an over-arching metaplot or anything. After 1998 I had advanced the timeline foward four hundred years to start with a fresh era of history using the D20 system but the entire experiment never really "jelled" for me due to the problems with moving a campaign that was very consistently built on AD&D principles into the D20 era. I later revamped that time period into C&C and then also returned to AD&D, but Lingusia wouldn't really get a proper reimagining until I devised Warlords of Lingusia for Pathfinder. That was a great campaign....but towards the end I really missed the "classic era" and thus why the reboot worked out so well for me. The new Age of Strife is my revisit of the best era of Lingusia gaming, cleaned up and modified to reflect the new timeline; removing my old "prophecy" stuff that led to some unfortunate decisions which made the campaigns of that era interesting at the time but problematic for the long run. 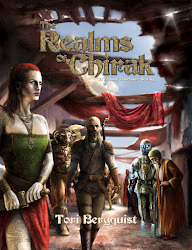 I guess another way of looking at it is like this: I learned a lot from running Realms of Chirak after 1992, specifically that keeping the entire setting in a narrow timeframe (all games from RoC 1992 to the present have taken place over roughly the same 20 year in-game time frame, for example) makes for much, much easier campaign management. Every time I jumped the plot and timeline for my Lingusia campaigns ahead a decade or three it outdated older campaign material and made me do a rewrite. I've done so many rewrites for Lingusia that I am, honestly, tired of it and don't want to do any more. The new era of the Age of Strife will be where I set all my Lingusia games going forward. While this rewrite takes into account the particulars of the 13th Age, I am gearing it toward an assumption that I will also use D&D 5E at some point.....but ultimately, this will be the absolute LAST era of the Lingusia campaign. I think there's more than enough "stuff" to milk out of the Age of Strife that I ought to be able to run games in this era for the next twenty years until I'm old and doddering and my son has theoretically taken over the mantle of DM.....! Next: the actual precis for the Age of Strife, now with context! First up the four Halo campaigns included are perfectly rendered, and do not feel in the least bit "off" as ports or anything. Halo 2 and Halo 4 stand out as the former has it's Anniversary Edition here with some cleaned up graphics that look even better than the Halo: Combat Evolved Anniversary Edition's redesign (albeit not "next gen" better but still good). The new cut-scenes for Halo 2 are some of the best I've seen yet, not just for Halo but any game this year. 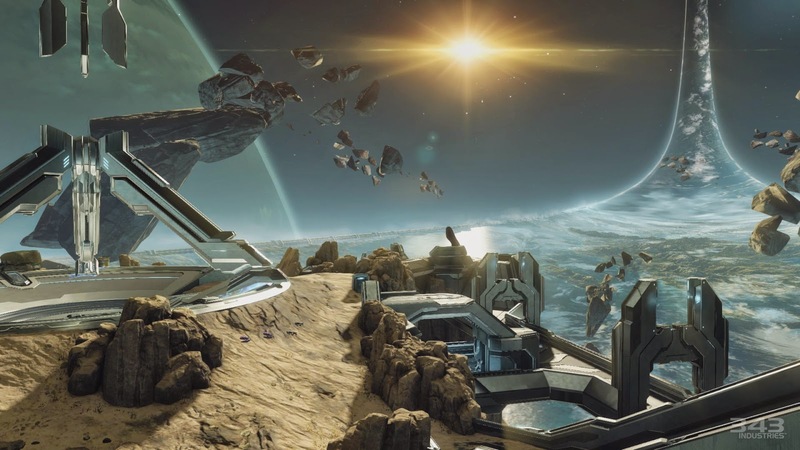 Meanwhile Halo 4 just looks incredibly nice; it clearly was designed with plans to port and upgrade to the Xbox One. Aside from the four campaigns there's apparently a ton of multi-player, none of which I've tried yet because I've been too focused on the single player content, and the stories about persistent matchmaking issues have made it easy to decide to wait for the patch on this. Missing from the release are the Spartan Ops missions from Halo 4, but I have been led to understand they will appear in December (whether as part of the core package or a DLC offering remains to be seen). My expectations are that the Spartan Ops missions, being part of Halo 4, had better be "core" and not something you purchase. 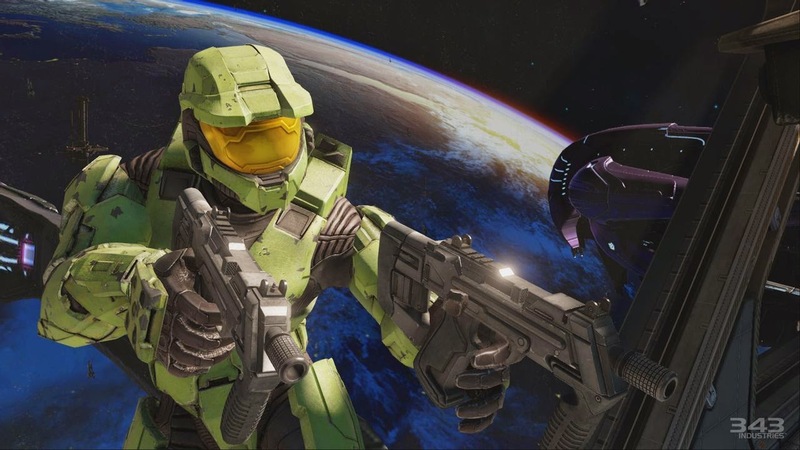 The regular multi-player had some connectivity issues for some, but apparently it was something 343 Industries could fix on the server side. Haven't experienced this myself yet (by simply avoiding multi-player) so couldn't tell you what that was all about. That said, MP fans will find that each iteration of the game comes with its own classic maps and mixes. The underlying MP engine is the same one that powered Halo 4's MP (I think, correct me if I'm wrong), but the thematics are tailored to your favorite iteration of the experience. I've never had a MP favorite, myself, so it's all equally interesting to me. Missing also from the mix are the survival modes which I don't think showed up in the series until Halo; Reach and Halo: ODST --which I sincerely hope get Xbox One upgrades next year. There's also a "mix mode" where you can string together a cluster of missions from across all four Halo campaigns into a sort of "best of" play mode. Nice extra feature. The first Halo Nightfall pilot is part of the deal, along with a new utility for delivering Halo-related content to your console., a sort of "Halo TV channel" feature with game videos, tips, music content and other stuff. If they add some Red vs. Green on there it will be well worth checking out. So is it worth it? If you're a Halo junkie like I am, absolutely. If you've never gotten into Halo before but want to try it out, this is the best bang for your buck. If you didn't like it before obviously this isn't going to change your mind. *Office of Naval Intelligence. They are the CIA-style spooks of the Halo universe. *If I had to guess I'd say he was a Mark II Spartan, one of the Spartans that were part of the program that predated Dr. Halsey's Spartan III program which focused on augmenting children. ***Leading to the untimely demise of the planned Deadlands series, unfortunately. Xauraun Vestillios is the immortal champion of chaos, who seeks to bring down the era of man and disembowel the worship of the pantheon of order. He commands ferocious armies of monsters and demons to this end, as well as the loyalty of the human subjects who seek to gain power in his era of rule. The Crusader is always interested in new agents and minions willing to sow strife among the lords of order. If you serve the Crusader: You are one who is comfortable in the company of fiends, possible one of the Order of the Ten Circles (the Divinate, in its public guise) or even one of the league of assassins that seek out those who would oppose the Crusader to lay them low. You could be of orcish or demonic descent, feeling the compulsion to serve the immortal chaos lord, or you are a man or elf who desires power at any cost. The dark sorceress of Hyrkania is a shadowy entity, known by name only to her inner cabal. She has an obsessive and seemingly one-sided alliance with the Crusader Xauraun, and works her own schemes to bring Hyrkania to its knees. She believes that conquering the empire will be sufficient to catch Xauraun’s attention. If you serve the Diabolist: you are a cutting-edge agent of evil and you can see the opportunity to both gain power in the Diabolist’s imagined future empire as well as ready yourself for the embrace of chaos. Rumors that Makhorven has orcish blood in his lineage are true, and it explains his grim, bestial visage and complexion. Makhorven is a power even while imprisoned in the vast dungeon complex between the city of Hyrendan, for the Order of the Red Robes insures he remains carefully protected and fed, and his network of spies and agents functions throughout the land. The Emperor’s unwillingness to execute Makhorven is still a mystery to many (though there is an ugly rumor of some sort of familial relation) though just as many suspect that Makhorven’s followers would never allow his death to pass. Makhorven is allied with the cults of the chaos gods, but he plays by his own rules and for his own gain. If you serve the Betrayer King: you work from the shadows, relying on physical force or magic as necessary to undo the empire from within. Though your liege suffered a great defeat, support is as strong as ever, just fluid like water so that the anvil of the empire cannot find you. You serve either the Black Circle, the Order of the Red Robes or the Divinate as an agent of chaos and change. The Grant Imperator of the serpent men empire of Hazer-Phennis serves exclusively the will of the dark god Set and his devilish minions, who spread like a cancer throughout the underworld. The rumors that the serpent men walk among humans and elves in magical disguise to sow discord are likely entirely true. If you serve The Serpent: few who do not have serpent blood serve The Serpent, but they exist. The Serpent is the embodiment of his people and his vile god, who seeks to subjugate the world to his rule. Following the Serpent means betraying your people for a piece of that pie, or it means being one of the pure-blooded, the humanoids who have a trace of ancient serpent ancestry within their veins. The Wyrmlords of the brood follow the Green Mother as they refer to her, a great chromatic beast to the north who dwells in the heart of the Northern Wilderness, giving birth to a new generation of the great dragonflight. The Green Mother’s Brood consists of her hand-picked finest brothers, sisters and those males who court the Green Mother. She sends them out to do her bidding. Rumors are that the Green Mother has determined to awaken the sleeping Tiamat to restore dragonkind to greatness once more. If you serve the Wyrmlords: there are many dragonborn who ally themselves with the Wyrmlords, and as many other races who envy the power of the dragons who know how to use it. The Wyrlmords are crafty manipulators and they seed their dark interests throughout the Middle Kingdoms and beyond, but they need even craftier agents to carry out their agenda of dragon superiority. I'll admit it: I've felt some burnout lately. The main problem is easy to figure out: I've run so many games so consistently over the last 34 years that I've all but exhausted my own avenues of exploration. The secondary problem is more recent: finding time to prep.....I don't have a lot of free time to do that. That's why games like D&D 5E and 13th Age appeal to me so much.....they are an easy sell to my groups and make the DM's life easier. That said, when you've run hundreds of scenarios and dozens of campaigns over the last decade and a half, it's easy to start feeling a little repetitive. Even if my players don't notice, I do. On a lark one of my players earlier this week asked if I'd be willing to run some official D&D modules for a change of pace. I decided...why not?....and proceeded to prep for the first scenario in the Ghosts of Dragonspear Castle. As it turns out, that was a GREAT idea. The module was fun to run (we're only partially through the first module in the four-part set) and it provided a framework that I could manipulate and feel challenged as a DM managing while not stressing me with the effort of trying to come up with something new from my usual repertoire as a DM. Simply put...I probably have about three or four dozen tricks and concepts I tend to use a lot in my games, and for the last year or so I sort of feel like I'm just rehashing old, well-trod territory. By running a module I'm breaking out of my comfort zone. Plus, I can still "make it my own," too. I've reskinned it so it's set in my Pergerron setting....changing the names to protect the innocent, so to speak (and any players who might have poked around and read a copy). The Lich King was once the greatest wizard of the realm but fell to the passions of the Unseelie Queen centuries ago, such that he was driven to seek out immortality that he would be “alive” for the time of her mortal return to the world. That time is now, and the Lich King is as much a pawn to the Unseelie Queen as he is an agent of his own necromantic self interest in the current era. The lich king has little interest in the current field of politics, but craves power and the expansion of his personal empire of undeath. If you serve the Lich King: you are either obsessed with death or the darker passions of the soul and admire the Lich King for what he offers….or you are a poduct of necromancy, doomed to obey him forever more. Zama was an elder druid who became hierophant during the last great war against the Crusader a century earlier. The war devastated his homeland in the Niras Forest, and motivated the druids of Niras to grow wary of outsiders and the threats they pose. Today, Zama’s influence as grand hierophant of his order is to create a sense of seclusion and remoteness in the forestlands of his dominion, and he relies on his agents to insure that any threat to the wellspring of the forest, which is the very embodiment of the god Niras’s spirit, be protected from outsiders. If you serve the High Druid: you are a druid yourself, or a simple elf, gnome or other denizen of the Niras Forest, who has felt the calling of the High Druid or the spirit of the woods and felt a need to protect the land from those who would ravage it. You might be a ranger or other agent of the Knights of Kom’Huandyr, a dedicated order of rangers in the woods who seek to defend the realm of the empire and specifically the province of Niras which encompasses all of the woods from outside invaders. Corrigan was believed to be destined for resurrection by her elite cabal of unseelie elven knights, but it was in fact the schemes of her paramour, the Lich King, that allowed her to be reborn. Corrigan walks the land again, a dangerous threat as she weaves her enchantments to lure dark elves and vile feykin into her web of control. She is barred from entry into the heart of the Weirding by the Court of Titania, and her unseelie agents are left deep in the mirelands and the briars of the outer Arboreal darkness, where the feywild touches the shadowfell. If you serve the Unseelie Queen: you felt the call and your fey blood could not resist. If you are no fey, then you are attracted to what she stands for, the liberation of the spirit from the rules of the world. The unseelie queen is a mysterious force in the age of strife but she stands against both order and chaos. Mithrielle rules Sylvias in the south and seeks to make her empire strong against the many forces of evil and chaos in the world. She is half-sister to the empress Phyxillus, but feels an unreasonable level of rivalry for her successful half-sister in the north. Under Mithrielle the elves have attained great power, but their enmity toward other lesser races is at an all time high. Actions in the name of the Elf Queen are to secure of the elven empire and its many outlying tribes and cities in the world, even at the expense of the lesser races. 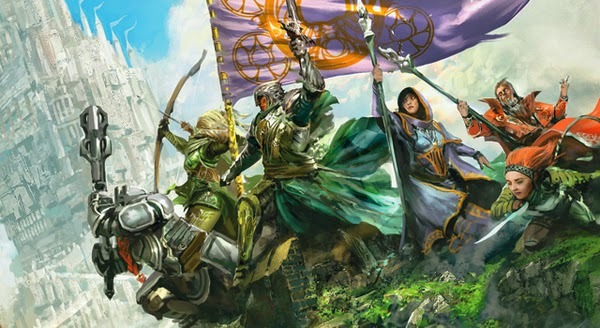 If you serve the Elf Queen: you stand not only against the enemies of the elvish kingdom, but against those who would seek to destroy the venerable lineage of the world itself in the name of power. You are likely either a selenic knight in the elven courts, a preservationist working in secret in foreign lands against the enemies of elvenkind, or a huntsman knight on the frontiers of Sylvias defending the outlying cities and tribes of all elves, both silver and wood. The great gold wyrm of this era is Drakon Shaikor, the most powerful of the gold dragons of the eastern clans. His influence is deep among dragonkind, and many say he has the ear of the Council of Wyrms itself, a secret society of the eldest dragons in the world who still remain free of the controlling machinations of the Wyrmlords. As may be expected, Shaikor and his allies revere Bahamut first and foremost. If you serve the Great Gold Wyrm: dragons alone do not serve the Great Gold Wyrm. Wizened sages, sorcerers who envy the gold’s power, dragonborn who wish to ally themselves with the agents of Bahamut and others will readily offer fealty to the Great Gold Wyrm. The enigmatic guild master of the Black Lotus gang and avatar of the the god Hermes is the undisputed shadow prince of the Age of Strife era. Wormie as his friends call him (because his enemies are all dead, as he says) is a wood elf of roughly two centuries in age who has become the master of secret lore and information in the land, and his agents are tasked with gathering such esoteric knowledge to greater purpose. Despite his nature as a thief and grafter, Wormie uses his agents to further the interests of the pantheons of order and death over chaos; there is no profit in chaos. If you serve the Prince of Shadows: you are one of the thieves, burglars, scoundrels and grifters of the world with a heart of gold, looking to your local thieve’s guild or possibly even THE thieve’s guild of the Prince of Shadows himself, the legendary Black Lotus Guild. From there you have earned enough trust and cred to find your services as a gatherer of information and protector of the civilized world to be useful to your liege. In many ways Celiobantes Astiriate is like Wormie, though the two are unrelated. Clawing his way up through the ranks of the Fire Knives, Celiobantes is a master of assassins and chief high priest of the assassin god Haro. Like the Black Lotus, the Fire Knives still commit to a dedication to order, albeit through murder as a tool of conflict resolution. The Fire Knives are usually regarded as agents of chaos by most…and they have been known to side with cultists of chaos, which their dark god is ostensibly one of, but true scholars of Haro know that the god considers himself above the petty cliques of the pantheons. If you serve the Assassin: a few independent operators exist who worship Haro, but universally if you serve the Assassin then you belong to the Fire Knives. The Fire Knives are expansive, with tendrils stretching across two continents and even into the Planar Realms, conducting murder in the name of their vile god. So if you hold this icon as your liege, then you must of necessity be proficient at murder most foul. Next: the villaonous icons at last! One more time for the Gear Maidens. Here's my rough D&D 5th edition interpretation of them, at least until the DMG arrives shortly and provides more precise monster design rules. And yes, this means I am currently running or conspiring to run some D&D 5E games in Pergerron. Construct: does not breath, eat or sleep. Multiattack: Gear maidens are equipped with two retractable blade arms. They may make up to four attacks (two with each blade). Retractable Blade Arms; melee weapon attack; +6 to hit, one target, 1D8+4 damage each. Special: critical attack on a 19-20. Gear maidens are an unusual construct sometimes found in the ancient ruins of Pergerron. 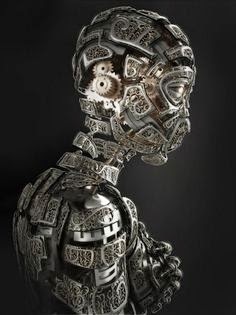 Each gear maiden has the appearance of a suit of armor or a mannequin made to look like a woman comprised of complex clockwork moving parts. Most of the gear maidens appear to be one of three types: jackal-headed, elvish-looking, and on rare occasion smooth, featureless faces with a mirror of silver where eyes, nose and mouth would be located. 1-4 - the gear maidens function as if the ruin around them is still alive; they prop skeletal remains up on chairs, serving them empty platters of food while serving long-dried bottles of wine. They will grow antagonistic to anyone who tries to point out the absurdity of their actions or the deathly nature of those they "serve." 5-7 - the gear maidens are mad, and appear to have suffered some sort of mania, which they may call "malfunctioning" to those who can prompt them to speak coherently. These are deadly, usually attacking randomly before fleeing, only to circle back later and strike again. 8-9 - some may be found which are coherent, usually hunting for parts. These gear maidens salvage relics of lore and preserve them, as if enshrining the lost civilizations of old Sar and other empires of the past. They are not above cutting down maddened versions of their own to salvage parts to repair themselves. 10 - Occasionally a cunning and vengeful gear maiden will be found. These are the deadliest, for they remember the fall of the old empires, and the destruction of those they served. They will seek to hunt down and exterminate all humans and demi-humans they come across, and will do so with great cunning and relish. Aside from the retractable blades (about as long as a short sword, but much sharper) gear maidens have the traits of other constructs, and are immune to any gaseous or poison attacks, as well as any attacks that affect life force (negative energy draining, for example). They are also immune to mind-affecting spells, for their magical artificial brains cannot comprehend or react to the magical influence of the mind. Lighting damage heals them. Cold damage deals 1/2 damage to them but they are slowed to a Speed of 10 feet for 1 round after being subject to the cold-damaging attack (until the end of their next turn). An entrepreneurial fighter with some weapon smithing skills could extract the arm blades of a destroyed gear maiden to find that they will make enchanted short swords of amazing quality (+1 short swords which crit on a 19-20).